On Thursday's Countdown show on MSNBC, after guest Howard Fineman of the Huffington Post predicted that Republican Congressmen would be reluctant to extend unemployment benefits, host Keith Olbermann asserted that, referring to congressional Republicans, "They don't live in this world. They don't live in this country. And I think we'd be better off if they didn't live in this country." Later, during the show's "Worst Person" segment, Olbermann attacked FNC's Roger Ailes for the second consecutive night - this time for his recent attack on NPR and Comedy Central's Jon Stewart. Olbermann addressed Stewart directly, suggesting that the Daily Show host was wrong to lump MSNBC in with his criticism of FNC, and also suggesting that the side representing FNC and conservatives is "close to playing with its poop." Olbermann: "Thanks to Mr. Ailes for proving my point about false equivalence. And an aside to Mr. Stewart: Jon, I told you so. I mean, I might disagree with you, but I'd never think you were crazy or hateful. But Maher is right. One side sticks to the facts, and the other side is close to playing with its own poop." KEITH OLBERMANN: In the year and a half that Jeanne Reinman watched her savings and retirement drain away, the members of Congress now blocking her unemployment benefits saw their net worth increase dramatically. In 2008 through the end of 2009, their wealth growing by an average of more than 16 percent. This is according to a new study by the Center for Responsive Politics. While Americans lost their jobs, their homes and their savings, watching retirement and their kids' college educations fade from possibility, Congress watched its number of millionaires increase - 49 percent, nearly half of them, 261 out of 535, are now millionaires compared to one percent of America; 55 of them - more than 10 percent - are now worth more than $10 million. Eight of those are worth at least 100 million. The median wealth of every member of Congress last year was $911,150. Individual congressional wealth leaped more than $100,000 in just one year. It was just $785,000 in 2008. The richest of them all, Republican Congressman Darrell Issa of California with a net worth of 303 million. And, as I sit here wondering what kind of nation we want to live in, let's bring in MSNBC political analyst Howard Fineman, also senior political editor of the Huffington Post. Good evening, Howard. HOWARD FINEMAN, HUFFINGTON POST: Hi, Keith. OLBERMANN: We have a political party demanding that we borrow money to pay for tax cuts on household income above a quarter million while it is at the same time refusing to borrow a lot less money so that middle class Americans who can't find work can keep their homes and just barely keep their heads above water. Can you put that into context with the findings of this new study on congressional wealth? FINEMAN: Well, Keith, the members of Congress don't have to suffer in silence on national television the way Ms. Reinman just did. When you asked her that question, I thought the most eloquent thing she said was what see didn't say when she couldn't speak because of the embarrassment and the confusion, of being an educated middle class person who now finds herself in the situation she's in. And that's what makes the contrast so excruciating. The members of Congress are insulated in many, many ways here. And even though they're supposed to represent the people, I think the month they get here, or even before they come here, given what it takes to run for office now - don't forget a lot of these people are self-funders now, a lot of it's their money - they get here and that keeps them even farther away from the people. OLBERMANN: Do they not get that they don't look like America? I mean, are they pushing for these tax cuts for $250,000 and up because it benefits them? FINEMAN: No, I don't think in most cases it's that, but I think they're definitely cut off here, Keith. It's the nature of politics today which, as I said, favors wealthy people who run, number one. Number two, the Washington area is not like the rest of America. A new Forbes study showed that nine of the wealthiest 14 counties in America are in the Washington metropolitan area. Then, when you're in Congress, you have platinum-level health care, you have great pensions, you have a very good salary, you're a member of the investor class, not the working class. And you're divorced not even from, not just from people on the shop floor or people who are poor, you are now disengaged from middle class America. That's what's so stark about this gulf, Keith. It's not between the richest and the poorest. This is not your grandfather's depression with the soup lines or your father's recession of 25 years ago. This is a thing where the gulf is between the leaders and the led between the wealthy in Congress and between middle class people that they used to be part of. OLBERMANN: What happens now? I mean, do Democrats cave on these Bush tax cuts for the rich in order to extend the unemployment benefits? And how does the GOP justify borrowing twice as much for that? FINEMAN: Well, first of all, the problem is that the White House sort of pre-caved. FINEMAN: They signaled their willingness a while back to accept something short of a permanent extension of tax cuts on the wealthy. And once they did that, that empowered the Republicans to think they could roll through this thing without any compromise whatsoever. And the situation of this lame duck here is it's becoming far more of a defining period of Congress for President Obama and for the Democrats than they ever figured it would be. And the Republicans are in no mood to compromise. The Republicans are willing to take the bet that Barack Obama and the Democrats aren't going to want to risk abolishing the tax cuts for everybody, at least even temporarily in some kind of crisis, than to take the Republicans on in this situation. So I don't know that that's how the unemployment benefits will be extended. I couldn't say for sure that that's a deal that will be made because I don't think the Republicans are going to be in any mood to do it. 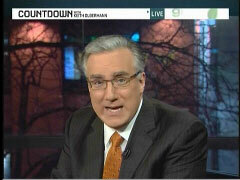 OLBERMANN: -political editor of the Huffington Post, thank you, Howard. OLBERMANN: Thanks to Mr. Ailes for proving my point about false equivalence. And an aside to Mr. Stewart: Jon, I told you so. I mean, I might disagree with you, but I'd never think you were crazy or hateful. But Maher is right. One side sticks to the facts, and the other side is close to playing with its poop.